The first accidental tomatoes have emerged. I’m so excited! 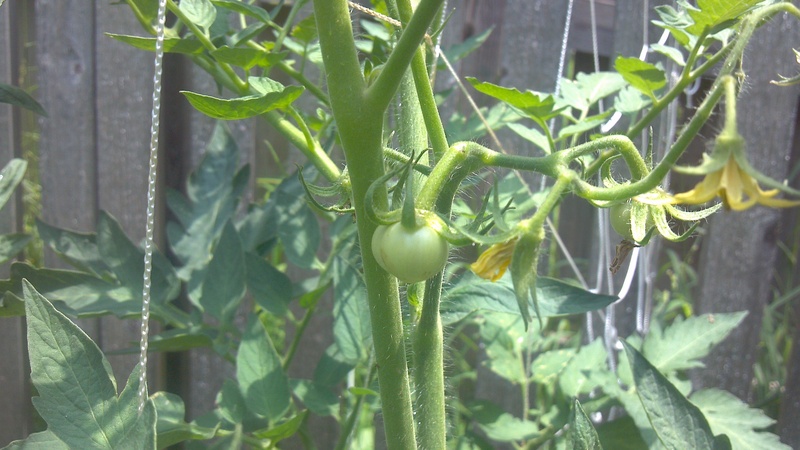 Not only are tomatoes one of my favorite things about summer time, but this is also the first time I’ve ever grown a tomato. And to think… it all happened on accident! Two baby tomatoes popping out! 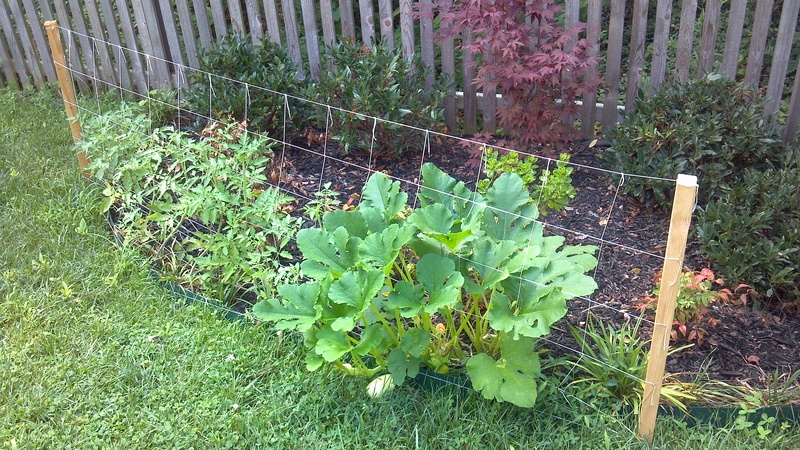 Here are a few photo updates to the accidental garden that appeared in our back yard. What started as vegetable plants from no effort have now invoked lots of work on our part. We strung up the netting all around to give the plants something to grow up, and now Ryan has taken to researching how to pollinate the squash flowers ourselves to ensure they all become little squashes! We’ll have to see how that process goes! As mentioned in the last post, six weeks ago some dear friends helped us landscape our yard. In the process we built a new bed along the back fence. 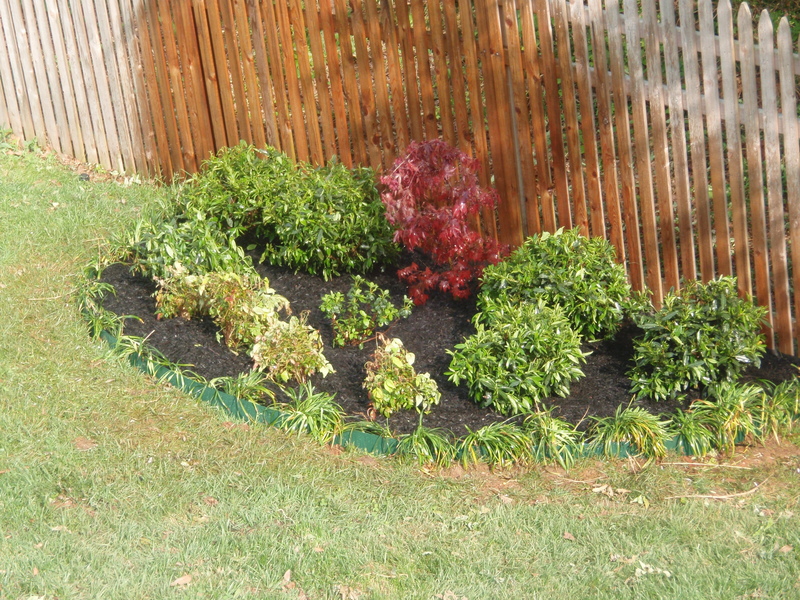 The monkey grass used to border the bed was planted using soil from our composter. This was the first time we’ve made use of the soil we’ve been accumulating for over a year now and we were excited to put the fruits of our labor to work for us! What happened next was… well, surprising (to us). Above is how the new bed looked just after completion, six weeks ago. We tended to it daily, watering, weeding as needed, etc. Then one day I noticed a number of “weeds” had cropped up in the monkey grass. For some reason I decided to just watch these for a few days (maybe I was just being too lazy to walk down the stairs and pull them). The day I went to pull the first one I noticed it was growing a pretty yellow flower and I couldn’t decide what it was. Pause here to understand that I’ve never grown anything edible besides herbs in planters before. Uncertain what it was I decided to just leave it for now, until my friend Jessie, the organic gardener, was over again. On her next visit she was showing me photos of her garden at home. Suddenly I saw a picture that looked identical to one of my weeds. I made her go back, asking what it was. Darned if she didn’t tell me it was squash. I said: I think that’s what’s growing in the monkey grass!! Sure enough, Jessie went down to inspect. 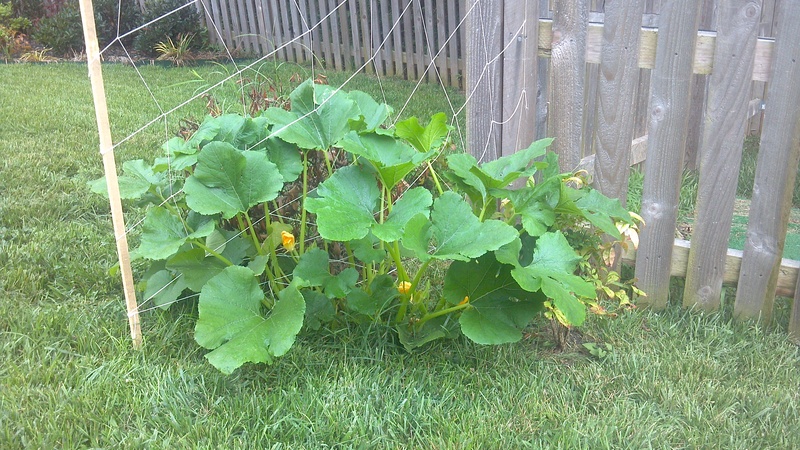 Not only are we growing multiple squash plants. 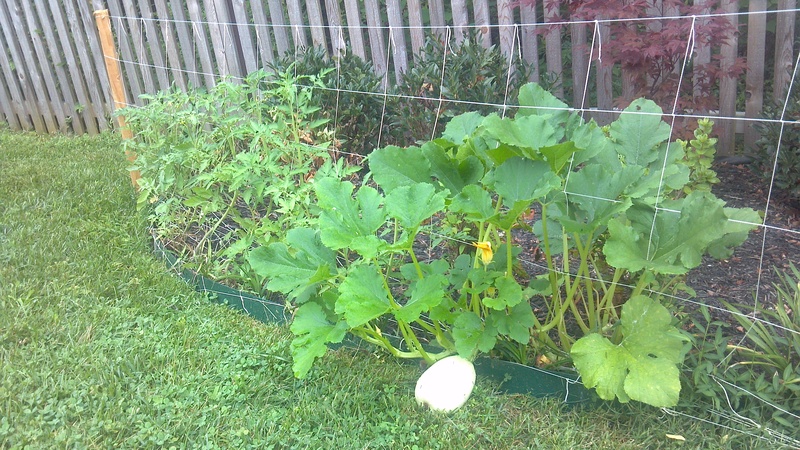 We are also growing about 10 – 12 tomato plants, plus something else she said looks like melon. I could not believe it! How was this possible. Then Jessie reminded us we had used the compost and it must have grown from our seeds in the compost. Ryan of course was ecstatic to hear all his hard work composting was paying off, until Jessie enlightened him that vegetables growing out of the compost soil was a sign that we’d been composting incorrectly. Well, I don’t care if it IS a result of our poor composting skills, I’m pleased as punch to be growing vegetables (especially tomatoes), and purely by accident! Jessie suggested we string up netting and give them a place to thrive. So that’s just what we’ve done. We finished the last of the netting Thursday before leaving town. 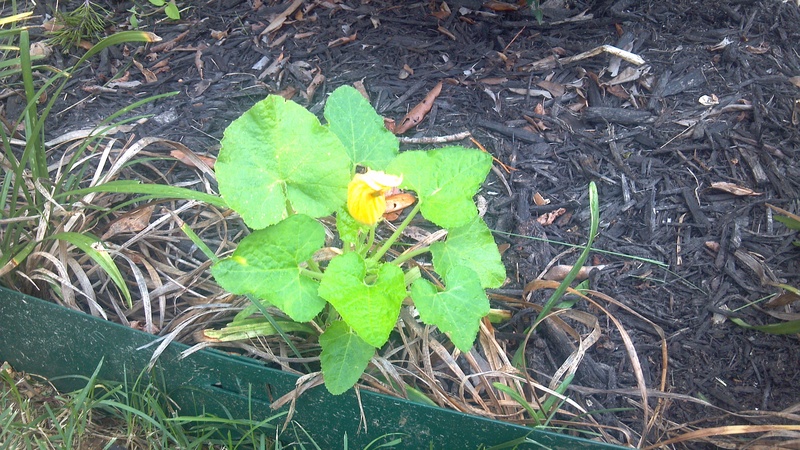 By the time we returned Sunday we had our first squash growing like a… well, a weed! P.S. 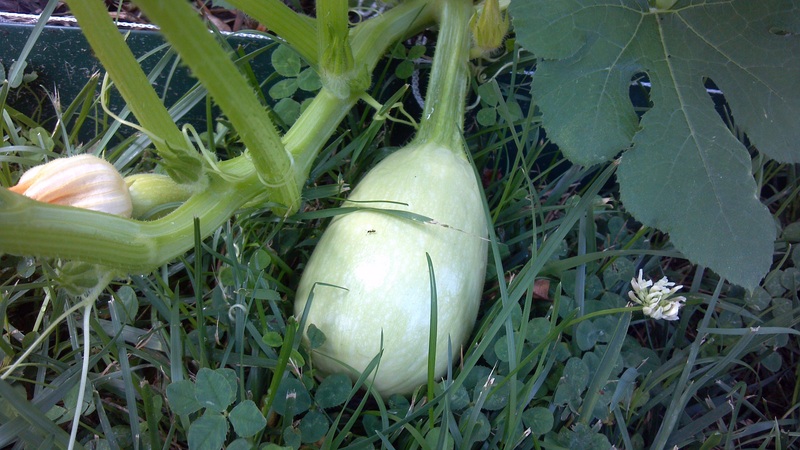 If you’d like to know how to garden on purpose here’s a post from Jessie on growing veggies from seed. Without hesitation I can say I have the greatest friends on earth. 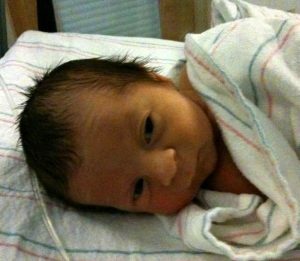 I know, everyone thinks they do, but seriously, check this out. About a month ago two of my friends, Carolyn and Jessie, spent the weekend with me and Ryan putting in two long days completely landscaping the front and back yard of our home. 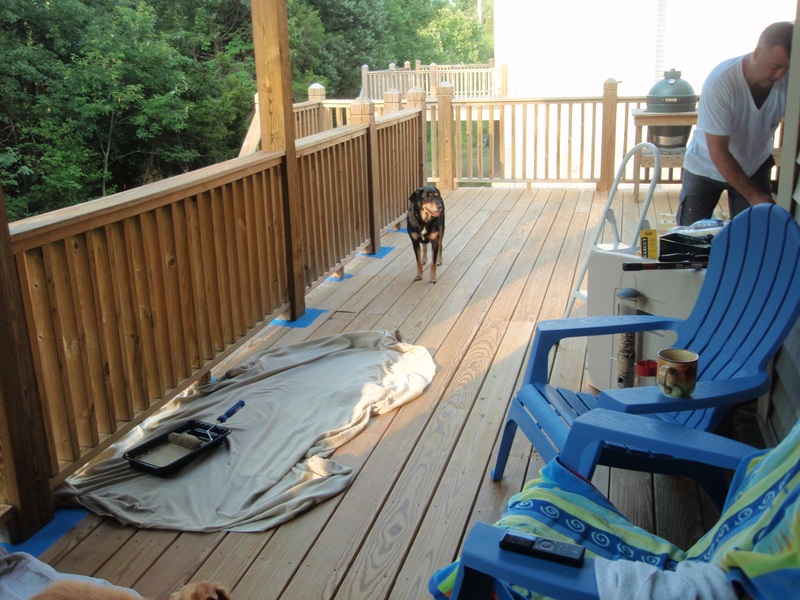 Last weekend, even though Ryan was gone, they came back and stained the entire deck with me. 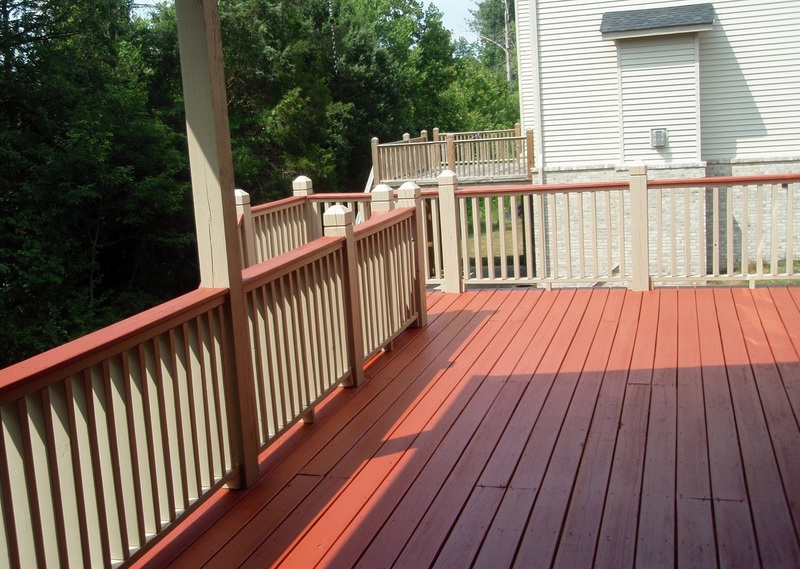 I’m talking about a second floor, 31×14 deck with more spindles than you notice until you are meticulously staining each one. We worked 11 hours Saturday and another 9 Sunday. 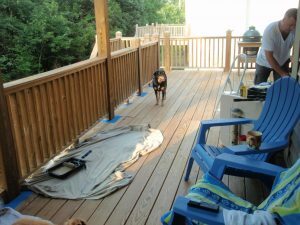 By the way, I hired Vince Henry to oversee the project and to do all the “ladder work” around the outside of the deck (plus all the other stuff we didn’t want to do). The four of us were like the dream team. Vince did an outstanding job and I highly recommend him if you need work done. Also, if you need to improve your golf putting game, check out his patented golf putter. A friend was recently sharing her frustration with me over a situation at work. She was grumbling about getting a negative response from senior management on a proposal she had initiated. As I helped her tease apart the various aspects of the process she went through, it became apparent that her frustration stemmed not from the message itself, but from the delivery of the message. Far too many leaders underestimate the value of “leading” over “managing” and this discrepancy can be responsible for driving high performers out the door and on to different organizations. When enough high performers are gone, the company is left with a large group of middle performers and a “larger than average” group of low performers. Management may convince themselves that the organization is packed with bright, talented high performers, and without contrast, it’s easy to assume that your top performers are, in fact, high performers. Back to my friend. She had submitted a proposal to initiate a cost savings effort to benefit the organization. It would have required a time investment on her part and some resources from the organization but she was willing to spend extra time and to demonstrate ROI. Senior management had agreed to meet and discuss her proposal. Following the manager’s meeting Sarah had to track down one of the management team to inquire if her proposal had been approved, or was at least open for further discussion. She received an email saying her proposal just couldn’t be justified and someone else would follow up with her. That ‘someone else’ she also had to track down. The message was delivered curtly and directly, leaving her feel deflated and demoralized. How likely is Sarah to take initiative again in the future with this organization? In The High Cost of Poor Communication Chip Wilson provides a great overview of the issues surrounding poor communication and the need for formal communication training for leaders in organizations. Formal communication training is often overlooked when training new managers. Seventy-one percent of employees feel that their managers do not spend enough time explaining goals and plans. On the other hand, many leaders avoid necessary communication because they fear negative results. For example, it was recently discovered that 38% of performance feedback actually hinders employee performance. This statistic could easily change if companies would invest in basic communication skills training for their managers. Understanding and removing communication barriers is vital for managerial success. Sarah, first I want to say that we all have great respect for your willingness to take initiative and create a proposal to help our organization improve. ACME places high value on taking ownership and responsibility, and the entire management team was impressed with your proposal. It is this kind of proactive approach to your work that shows you are not only a high performer but also will do well here at ACME, and we hope that you will be happy with us for many years. Unfortunately, we were not able to approve the resources needed to move your project forward at this time, though we do think the idea has merit and we’d like to put it on the list of projects up for approval in our next budget year. When we are able to get this approved we would like for you to help us spearhead the effort, of course. Thank you again for your great work here at ACME. We welcome all of your ideas. This is what helps us improve our organization – employees like you! When I pitched a response like this to Sarah I could see her immediately relax and her entire body language change. She admitted it was true – in fact a “no” would have been perfectly acceptable, had she simply been communicated with clearly and directly, and made to feel like a valued, respected member of the team. Feedback connects people and their behavior to the world around them. It gives everyone the chance to realize how their behavior influences the success of their organization. Effective feedback will reinforce positive behavior and correct negative behavior. The ability to give and receive feedback is a must for leaders who wish to have honest and direct relationships with employees. Is it odd to anyone else that we have to put actual effort into figuring out how to eat the same way that people have eaten for thousands of years? A week or so ago someone told me about The Night Owl Cafe, located in Old City, downtown Knoxville. He said they use all locally sourced and organically grown foods, which made me wonder how I haven’t heard of it sooner. Some more research told me that it’s still fairly new, and apparently they don’t try real hard to be found. As best I can tell they unabashedly have no phone, and apparently no website, though they are on Twitter and Facebook. And there are plenty of rave reviews. Sounds like the owners of The Night Owl focus on doing one thing and doing it well: providing good, fresh food. I’m not going to write a review though, because I still haven’t been there. Yet. If you have, please let us know how you liked it! Looks like they get at least some of their food supplies from Organicism Farms, which posted the below list on their Facebook page. I’m sharing it here, so all the non-Facebook users can access as well. Thanks to all the local Knoxville businesses who support not just us but all the local organic growers: The Night Owl Cafe, Chez Liberty, The Tomato Head, The Orangery, Rouxbarb, Aisle Nine Grocery, Three Rivers Market, Benefit Your Life, Natural Products Market, VGs Bakery, Sun Spot, Java, and Spoiled Pet Cafe. Eat fresh. Eat Local. Eat Organic. Aerobic activity actually makes you smarter! When you exercise, your muscles release protein that travels through your bloodstream and into your brain, where it builds new brain cells and causes them to link together. Studies show that fit individuals (those with normal BMI and strong aerobic capacity) perform better on tests and complex tasks. Under MRI, fit individuals demonstrate increased brain activity in the prefrontal cortex (responsible for executive function) than non-fit individuals. And in schools, children who took their toughest class immediately after aerobic activity performed much better than those who took the class at the opposite end of the day from aerobic activity. Want to think more clearly and perform better? Move your body every day! For more on exercise’s amazing benefits for your brain, check out the new book Spark: The Revolutionary New Science of Exercise and the Brain .